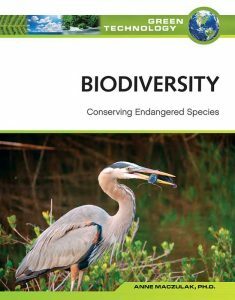 Biodiversity: Conserving Endangered Species explores the relationship between habitats and adaptation-two important areas of biodiversity, a field devoted to the study of the variety of living things on Earth or within a specific area. The book looks at the ways in which habitats are destroyed, the devastating effect this has on biodiversity, and the ways in which environmental scientists try to save endangered species by restoring their habitats. Sidebars citing actual examples and statistics, figures, and case studies enhance fundamental concepts and give the reader a sense of the urgency of the issues related to biodiversity. The book contains 50 color photographs and line illustrations, three appendixes on conservation and diversity, a glossary, a detailed list of print and Internet resources, and an index. Green Technology is essential for high school students, teachers, and general readers who seek information on the important issues that affect the environment worldwide.